Identification: Striped hard-backed beetles that look similar to lady beetles but are larger. Biology and Life Cycle: Adults are yellow with black stripes on the wing covers and dark dots behind the head. Larvae are reddish with black legs and head. They change color to pink or orange with two rows of black spots on each side. Eggs are yellow-orange laid in rows. Young unmated adults hibernate through the winter in trash piles, old lumber, and other litter on the ground. Habitat: Eggplant, potatoes, tomatoes, and other nightshade plants. Feeding Habits: Adult beetles and larvae feed on plant leaves. Economic Importance: Food crop destruction. Natural Control: Ground beetles, assassin bugs, and giant wheel bugs. Organic Control: Bacillus thuringiensis 'San Diego'. Insight: Malcolm often tells a story about hand-picking potato beetles (see Insight section in Giant Wheel Bug entry) and often gets the argument that this approach is not practical for really large acreage. However, he knows a woman from Germany who tells about her childhood school shutting down for up to two weeks so the students could go pick potato beetles in the big fields. She said they always looked forward to beetle-picking time. We could do the same in this country; it would be a great educational experience for children and organizations like 4-H, FFA, and Boy and Girl Scouts. The adults three-lined potato beetle (Lema trilineata), also called old fashion potato beetle, feeds on potato plants and eggplants. 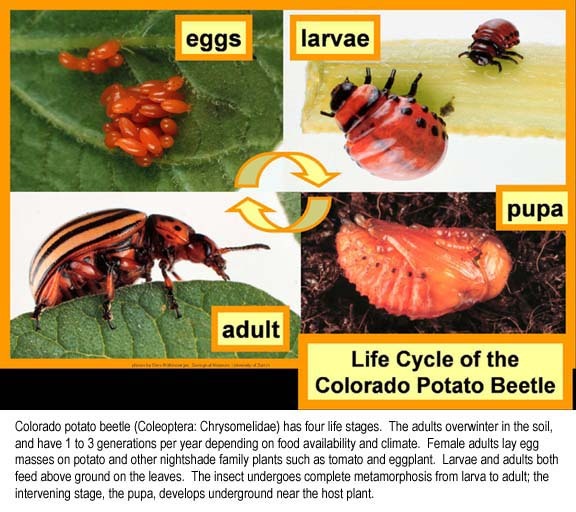 The eggs are similar to Colorado potato beetle eggs in size, color and shape. They exude frass that looks like brown saliva out the top of their back, if disturbed, they convulse their bodies to rid themselves of the frass mass and quickly crawl away. When they start feeding again they produce more frass. When the larvae reach maturity, they fall to the soil. Within a few minutes the fire ants come and dig around them as if to make them comfortable, then the fire ants cover the larvae with small dry sticks. The dry sticks absorb the saliva type frass like a sponge, when the saliva frass seems to be drying on the sticks the ants carry it all to their mound. The larvae are now clean and shiny. Then ants cover the larvae with soil and larger sticks and the larvae spins a thin silken cocoon, pupates and eventually emerges as an adult beetle. Fire ants like this fluid frass as food but they can’t carry it. It’s like trying to carry jello with a pair of tweezers so they sponge it up with dry sticks.